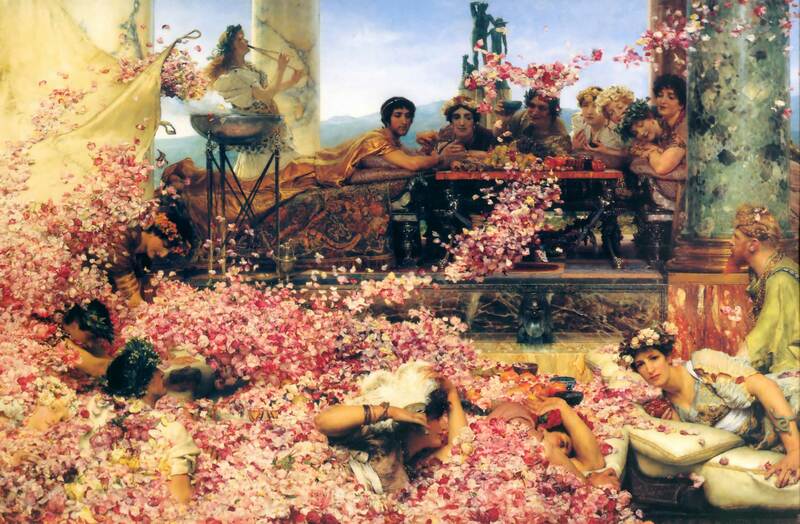 Sir Lawrence Alma-Tadema’s painting The Roses of Heliogabalus (1888) is based on an apocryphal episode in the sybaritic life of the Roman Emperor Elagabalus (204-222 A.D.), who is said to have suffocated guests with flowers at one of his feasts. The painting is in a private collection, but I saw it for real in an Alma-Tadema exhibition at the Walker Art Gallery in Liverpool sometime during the late 1990s. I wasn’t disappointed: it was a memorable meeting with a painting I’d been interested in for years. Roses is impressively large and impressively skilful. Close-up, the brush-strokes are obvious, obtrusive and hard to interpret as people and objects. It isn’t till you step back, far beyond the distance at which Alma-Tadema was painting, that the almost photographic realism becomes apparent. But you get more of the many details at close range, like the Latin inscription on a bowl below and slightly to the right of that scowling water-mask. Alas, I forgot to take a note of what the inscription was, though perhaps the memory is still locked away somewhere in my subconscious. Whatever it is, I feel sure it is significant, because Roses is rich with meaning. That’s a large part of why I’m interested in it. Yes, I like it a lot as art, but the women would have to be more attractive for it to be higher in the list of my favourite paintings. As it is, I think there are only four reasonably good-looking people in it: the man with the beard on the right; the flautist striding past the marble pillar on the left; the red-headed girl with a crown of white flowers; and Heliogabalus himself, crowned in roses and clutching a handful of grapes beside the overweight man who’s wearing a wreath and sardonically saluting one of the rose-pelted guests in the foreground. When I first wrote about Roses in a pub-zine whose name escapes me, I misidentified the overweight man as Heliogabalus himself, even though I noted that he seemed many years old than Heliogabalus, toppled as a teen tyrant, should have been. It was a bad mistake, but one that, with less knowledge and more excuse, many people must make when they look at Roses, because the overweight man and his sardonic salute are a natural focus for the eye. Once your eye has settled on and noted him, you naturally follow the direction of his gaze down to the man in the foreground, who’s gazing right back. That deliberate choice of dimensions for the canvas led me to look for more instances of φ in the painting, though one of the most important and obvious might be called a meta-presence. The Roses of Heliogabalus is dated 1888, or 1666 years after the death of Heliogabalus in 222 AD. A radius at 222º divides a circle in the golden ratio, because 222/360 = 0·616… It’s very hard to believe Alma-Tadema didn’t intend this reference and I also think there’s something significant in 1888 itself, which equals 2 x 2 x 2 x 2 x 2 x 59 = 25 x 59. Recall that 416 is the expanded short side of Roses. This equals 25 x 13, while 673, the expanded long side, is the first prime number after 666. As one of the most technically skilled painters who ever lived, Alma-Tadema was certainly an exceptional implicit mathematician. But he clearly had explicit mathematical knowledge too and this painting is a phi-pie cooked by a master matho-chef. In short, when Roses is read, Roses turns out to be golden. *φ is more usually represented as 1·6180339887498948482045868343656…, but it has the pecularity that 1/φ = φ-1, so the decimal digits don’t change and 0·6180339887498948482045868343656… is also legitimate. I’ve looked at more of Alma-Tadema’s paintings to see if their dimensions approximate φ, √2, √3 or π, or their reciprocals. These were the results (ε = error, i.e. the difference between the constant and the ratio of the dimensions).